Western Energy® is the voice of Western Energy Institute's 800+ volunteers and members, providing best practices, solutions and conversations about the most pressing business and operational challenges facing electric and gas industries serving the Western United States and Canada. Annual photo contest now open. Find out more. 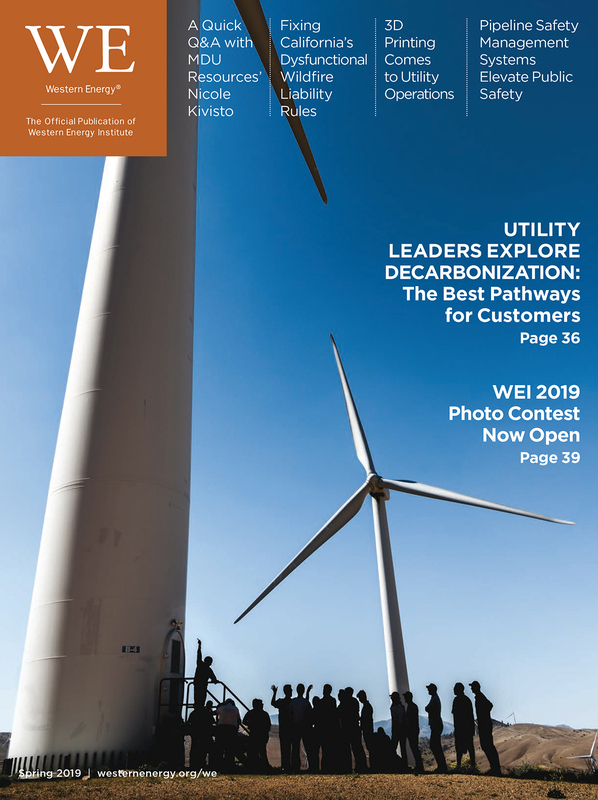 WEI’s quarterly publication is distributed to more than 6,500 decision-makers of public and private companies involved in electric generation and transmission, gas and electric distribution, pipeline operations, power marketing, and energy-related services. Content is contributed from WEI member companies and industry partners and offers unique perspectives pertinent to energy executives and managers who face common business challenges spanning across front line operations to back office functions. Interested in contributing an abstract or article idea to WE magazine? We want to hear from you. Click the cover to view our current digital edition, or download our iPad or Android app for easy reading. Interested in reading past issues of the magazine? Western Energy magazine has been published since 2011, and our collection of past digital issues are available online for free in our archive. Want to submit an article for publication? For full information on the type of articles we look for, download our writer’s guide containing information on writing style, answers to FAQs and the editorial calendar. Have you seen WE magazine’s 2018-2019 buyers guide? Check out the fifth annual buyers guide for a comprehensive listing of energy-related products and services organized by category. Advertising delivers your message directly to the key decision makers. Gain access to the C-level suite of all member utilities, as well as directors and managers of operations, customer connections and corporate functions. Key groups within our readership include engineers, economists, business personnel in human resources, finance and accounting and the frontline trade employees. Your WE advertising contact is Mike Holley, Publisher, Apogee Media Group at mike@apogee-mg.com or 916.378.5014.